Garage Door Repair Peachtree City: Can Garage Door Sensors Go Bad? Can Garage Door Sensors Go Bad? Have you been Googling “garage door repair near me” or “garage door installation near me” in hopes of finding the best garage door company in your area? Well search no more, Nabors Garage Doors is here to help. Give us a call today if you’re ready to get started with a garage door repair or installation service. In the meantime, have you been wondering about your garage door’s sensors and how to know if they’re going bad or no longer working? Read on to learn about troubleshooting these devices. What Are Garage Door Sensors? If you’ve been a homeowner for some time, you’ve probably noticed that your garage door won’t close if you’re standing in the way or if there is an object in its path. This is because there are safety sensors on either side of the door that prevent it from closing. This is an important feature, not only for safety but for security as well. If your garage doesn’t close all the way, it could be susceptible to thieves or other intruders. Are The Sensors Working Correctly? If it seems like your garage door isn’t working the way it should or it isn’t closing or opening, you may have a problem with your sensors. The first thing you should do to test your garage doors sensors is to clear everything out from under the garage door. Try opening and closing the garage door several times allowing it to fully close and open each time. Make note of what the garage door does and place an object in front of one of the sensors. If the garage door doesn’t close, try placing an object in front of the other sensor. 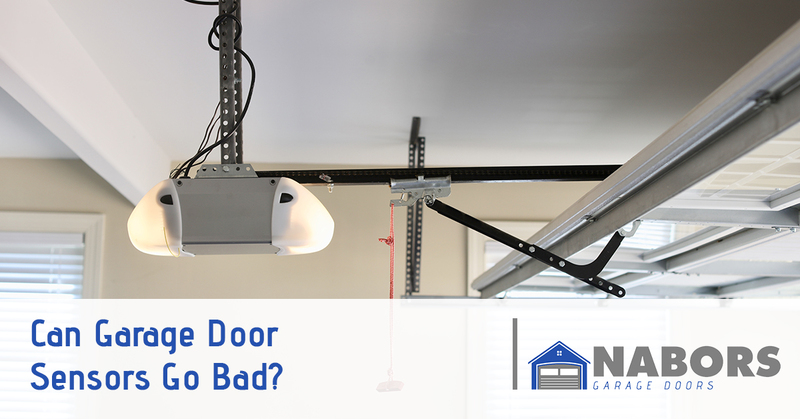 If the garage door is still closing with an object in the way or if it’s refusing to close when there are no objects in the way, you could have a problem with your sensor alignment, wiring, or one or more of the sensors are not receiving power. If you know for sure that there is an issue with the sensors or something else funny is going on, it’s important that you get the issue fixed before you continue using it. Even if it isn’t an issue with the sensors, it could be another safety or security risk that should be addressed. Attempting a DIY fix is never ideal, so you’ll need to contact a garage door repair company. Nabors Garage Doors is your Top Rated Local® garage door company in Peachtree City and the surrounding areas. Our team of experts specializes in diagnosing garage door problems quickly and efficiently and providing you with affordable pricing. We pride ourselves on helping the local community with dependable services and will never offer you something that you don’t need. Whether you’re simply looking for us to investigate issues with your sensors or you’re in the market for a brand new garage door, we’re here to help. Contact us today.